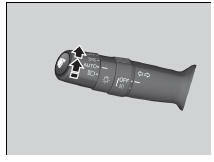 Automatic lighting control can be used when the ignition switch is in ON *1. When you turn the light switch to AUTO, the headlights and other exterior lights will switch on and off automatically depending on the ambient brightness. You can change the auto light sensitivity setting. We recommend that you turn on the lights manually when driving at night, in a dense fog, or in dark areas such as long tunnels or parking facilities. The light sensor is in the location shown below. Do not cover this light sensor with anything; otherwise, the automatic lighting system may not work properly. The headlights automatically come on when the wipers are used several times within a certain number of intervals with the headlight switch in AUTO. 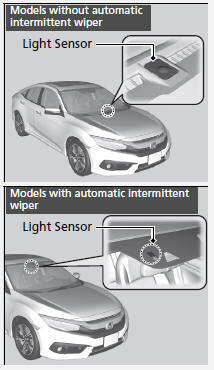 The headlights automatically go off a few minutes later if the wipers are stopped.